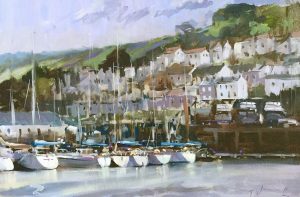 The famous harbour has been painted in a loose and impressionistic style. The painting has a sketchy but faithful rendering of boats and houses as they weave together across the composition. Essentially an impressionist piece, this painting is an iconic example of English coastal painting. Trevor makes the viewer aware of the location by his use of colour and atmospherics. The boldness of approach is subtle in it’s execution, considering the complexity of the subject matter, boats and houses intermingle in this intimate tableaux of Dartmouth Harbour. The eye eventually comes to rest at the waters edge and is met with restful reflections.